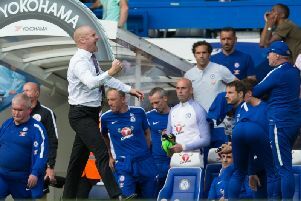 Clarets boss Sean Dyche was delighted with his side as they roared into a 3-0 lead at Rangers inside an hour. But he felt the last quarter of the game was "unacceptable" as they let their foot off the pedal, as the hosts pulled one back. An Andre Gray hat-trick - taking his tally to eight in five pre-season games - put Burnley well in control, but Dyche knows his players have to stay switched on for the full 90 minutes and beyond in the Premier League or suffer the consequences. Dyche said: "Andre's going really well, he's fit and in good form, there's a number of them in good form. "I was generally pleased today but the last 30 minutes was unacceptable from our team. "Some of it is fitness, fatigue, that weird thing when you're 3-0 up you can get a bit lax, but you can't do that in the Premier League, we were there two years ago and teams will hurt you. "We have to learn from that. "Fitness will improve and as that improves, focus and concentration improves. "But we need to be more secure than that in games with the ball. Our shape just got a little bit loose at the end, that was my only disappointment, but it's another step forward in pre-season, everyone is fit and well, which is another bonus." "It was really useful, Rangers tend to play a way similar to the Premier League, they try to play out from the back constantly, try to open up the pitch and make big spaces. "We've come across it before in the Championship and in the Premier League most try to play like that. "With all due respect to Rangers, who are a very good side, Premier League players have that bit more quality as well." Stephen Ward was an absentee from the teamsheet, as Dyche explained: "Wardy has pulled his hamstring, it's not a drastic one but it will be into next week before we know more."